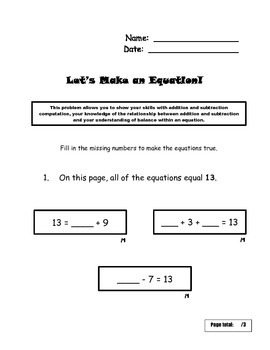 Students demonstrate their skills with addition and subtraction computation, their knowledge of the relationship between addition and subtraction and their understanding of balance in an equation by filling in missing numbers to complete a variety of addition and subtraction equations. Can be a follow-up to my Equation Collaboration activities. The final question is designed to show which students are working beyond standard.